This blender muffin thing has gone way past obsession. Seriously… I just keep eating them! And judging by the hundreds of you who have been posting your own pictures of the blender muffins on your blogs or social media, it’s clear I’m not the only one who’s completely obsessed with these muffins! 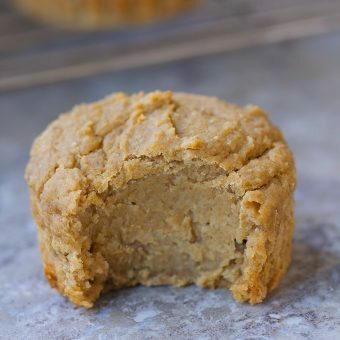 Initially, I was hesitant to even post the original blender muffin recipe, because they’re so different from traditional muffins and I worried others might not love the extra fudgy texture as much as I do. But I could not have been more wrong! 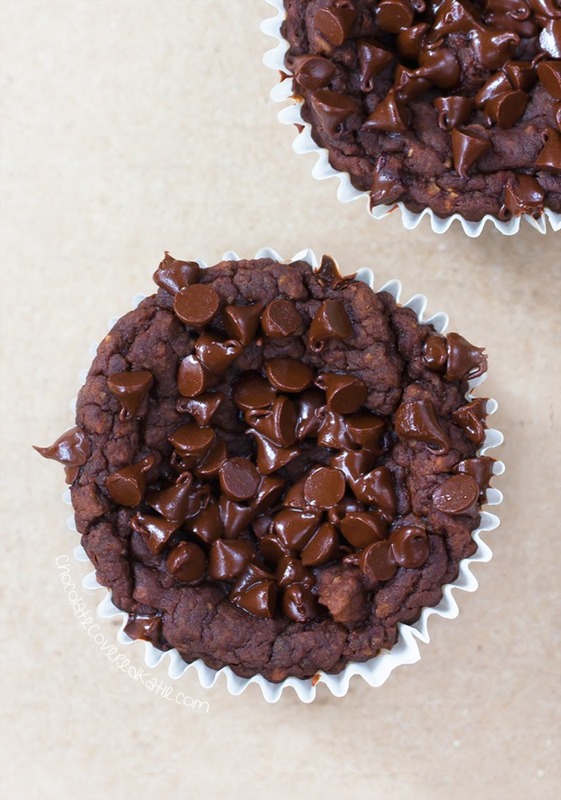 Almost three months later, these blender muffins are still being shared at an astonishingly fantastic rate – 100k repins on Pinterest and counting! And now there is a Nutella version. 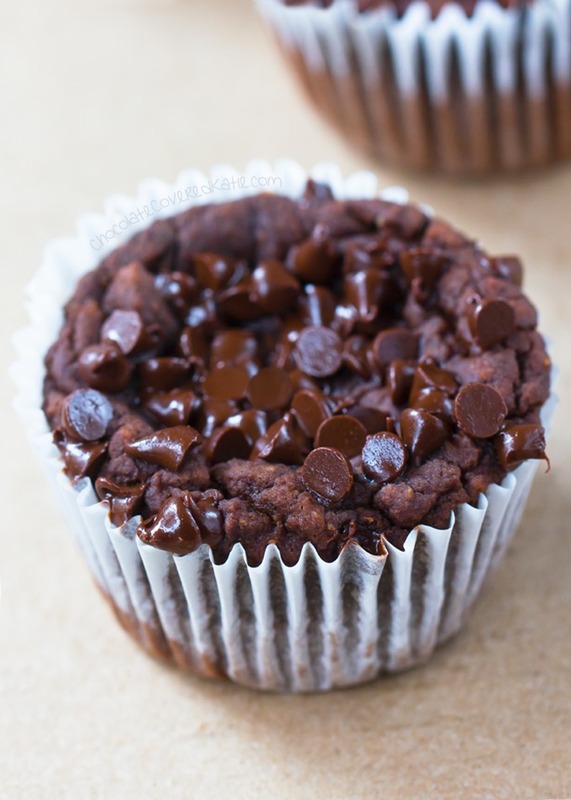 It’s a mash-up between my original blender muffins and the chocolate blender muffins. No, not literally… although that would probably be really delicious, now that I think about it. I used my own homemade vegan Nutella for these, but any chocolate hazelnut spread will do. The chocolate chips are optional this time – I didn’t add any to the batter, but I decided to sprinkle the tops with mini chips for the purpose of both presentation and taste. Okay, mostly just taste. 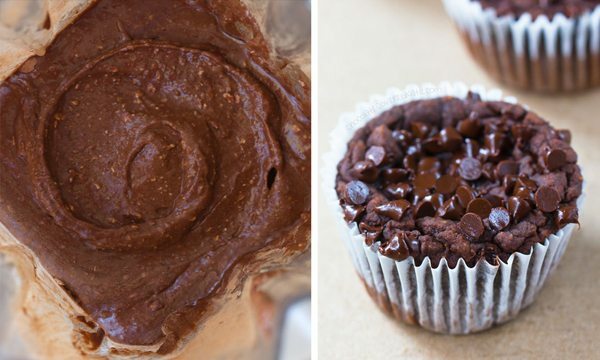 When chocolate and Nutella are involved, who really cares what they look like anyway? 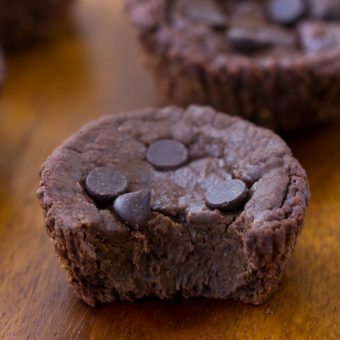 Just throw all of the ingredients into a blender or food processor, blend until smooth, portion the batter into muffin tins, and bake them in the oven. No bowls, no mess, and easy cleanup. This particular batch of flourless Nutella muffins was part of a huge Father’s Day brunch spread. My parents were visiting on Father’s Day, and I took full advantage by feeding them recipes possibly going in my second cookbook as well as recipes I’m testing for future blog posts. My mother is a great recipe tester who has absolutely no qualms about delivering her critique of a recipe with brutal honesty, and my father is a great recipe tester for a different reason – he will eat anything! Between the two of them, I get honest critique and no food wasted. Preheat the oven to 350 F. Line 8-9 muffin cups. Drain the beans and rinse them extremely well. Pat dry. This gets rid of any bean flavor. Blend all ingredients until smooth. 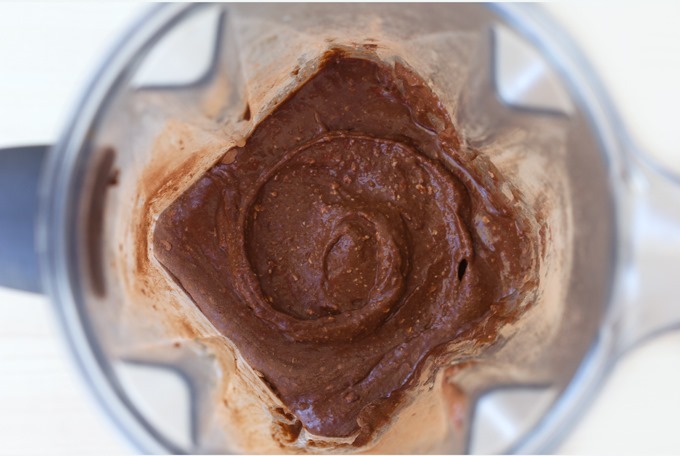 If using a blender with no tamper, stop occasionally to stir with a spoon for even blending. Stir in mini chips if desired. Smooth into muffin cups – don’t overfill them or the muffins will rise and then sink in the centers. 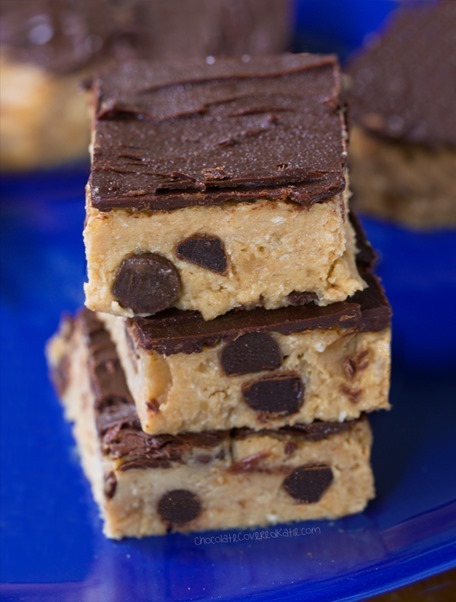 Press some chocolate chips into the tops if you wish. Bake 13 minutes. They’ll look underdone, which is what you want. Let cool completely, then transfer to a container and cover overnight in the fridge. They will firm up perfectly. As with the other blender muffin flavors I’ve posted, these are supposed to be fudgy, not fluffy or floury like regular muffins. Not everyone will love the texture; but if you like the other flavors, you will probably love these too! Muffins are good for 3-4 days refrigerated or 2-3 weeks frozen. 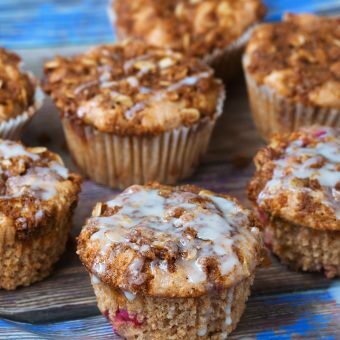 Coffee Cake Muffins – Perfect For Breakfast! 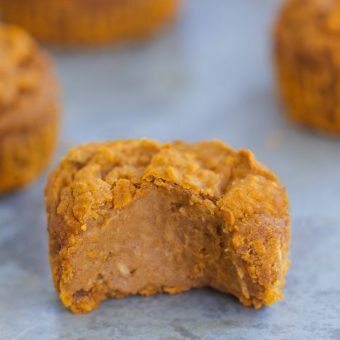 « Peanut Butter Cookies – Baked In A Muffin Tin! When I made your Peanut Butter Cookie “muffins” yesterday, I was testing the waters on something. I had made PB in my VitaMix (as I always do) and had a cup remaining. I hate trying to get all the PB out of it, so I put the rest of the ingredients in the VitaMix with the PB and the Cookfins (muffkies?) came out amazing. I can’t wait to make these too. And thank goodness I can use applesauce because I have a serious aversion to bananas. Thanks! Oh my goodness! These look so good. Your recipes are always really good. I’m sure this will be too. Thank you Katie! I have never been much of a nutella fan (gasp I know haha) but these look amazing. 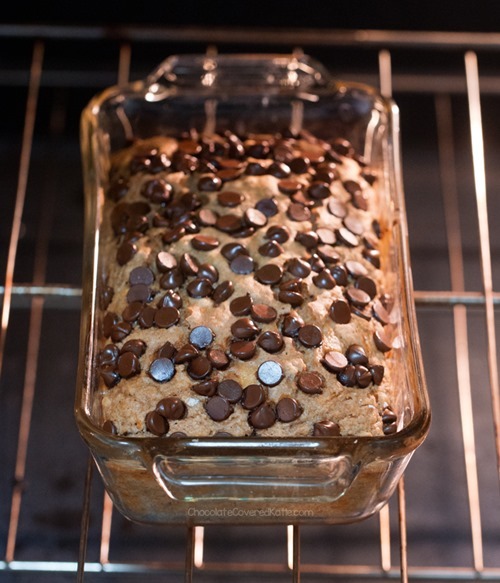 You make me want to attempt baking with black beans again! Great picture of you and your dad. Oh my gosh – these look so yummy! I just made these and while I’m waiting for them to cool, I can say they smell amazing! One thing I noticed is that if you don’t have a strong blender like a Vitamix, I would use a food processor. My blender had real difficulty mixing this, and if I wasn’t feeling too lazy to do extra dishes, I would have switched and did it in my processor. I can’t wait to try them! Thank youuuu! 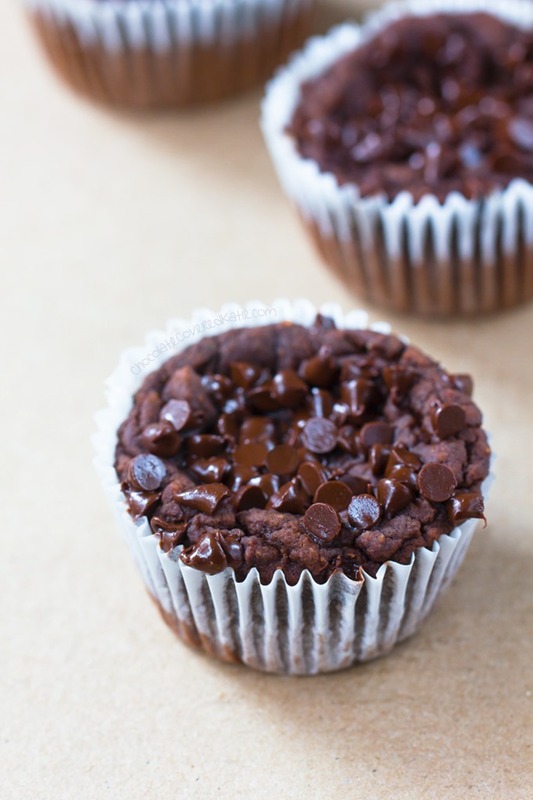 As a chocolate lover, these look incredibly amazing and I love how simple they are to make! I have tried making this muffins last week but the muffins are too hard but the nutella taste is good. Can you give me some suggestions or tips. So that I can try it again. Can I sub almond butter for the Nutella? I made these last week and they’re absolutely AMAZING!!! I’m making them again tonight. Thank you so much Katie!!! I was a little bad and tried one once it was fully cooled but hadn’t been in the fridge overnight yet- it tasted amazing, though it did try to fall apart. Can’t wait to try them once they’ve been given a chance to firm up. I’ll definitely be making these again!